They wobble. They pull up. They shake, spin and pop! And they make you smile! These 5 interactive birthday cards are ideal for kids and kids-at-heart to help them celebrate. 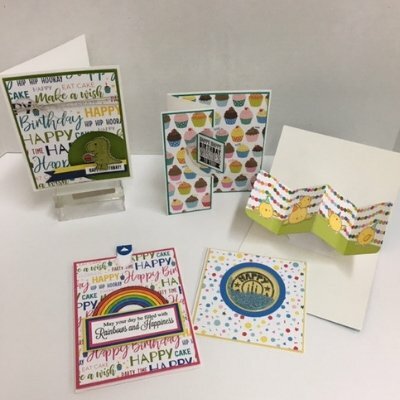 These cards look complicated but are easy to make, and Alexis will share her tips and tricks. You'll even get an acrylic stamp to take home. Requirements: Please bring basic tools like scissors and piercing tool, as well as various adhesives including tape runner and 3D foam (tape, dots, squares).